Recovery Explorer Professional is a robust instrument that will cope even with most challenging data loss tasks that technical experts may come across with. The software handles a broad set of devices, file systems and RAID configurations. The application can boast a wide variety of tools for viewing and editing contents of disks, partitions and files in the hexadecimal mode as well as for low-level analysis of data consistency. What is more, the program is capable of decrypting disk volumes for data recovery and data access purposes while the disk-on-disk recovery technology lets you open a virtual disk nested on a physical storage, allowing to recover data straight from a virtual machine without the need to extract virtual disk first. This powerful utility is the first choice of those who have highest demands to the data recovery software they use. 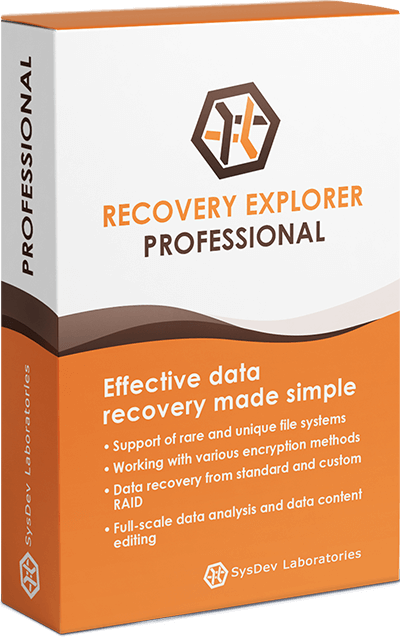 Recovery Explorer Professional is aimed at providing the general public with lucid and exceptionally convenient to use means for professional-quality data recovery. If you’re an expert in this field, you might also be interested in a more specialist-oriented software – UFS Explorer Professional Recovery. Learn about the difference between these products and choose the one which perfectly meets your individual data recovery needs. MiniSDs, MMCs, Memory Sticks, etc. Standard RAID patterns: RAID 0, RAID 1E, RAID 3, RAID 5, RAID 6, RAID 7, etc. Hybrid RAID Levels: RAID 10, RAID 50, RAID 60, RAID 50E, etc. Personal, Corporate and Commercial licenses are available, each granting specific rights of software use.